And this is What this Site is all About... Using Badminton Training Techniques to Get an Instant Advantage Over Your Competition"
I've included a few examples for you at the bottom of this page to help you get started. To receive my free report - '3 Simple Exercises to Give You a Lightning Smash' and subscribe to my monthly 'Badminton Fitness Tips' newsletter, simply enter your name and email address below. You'll get immediate access to your FREE report and can unsubcribe to my newsletter at any time. PLEASE NOTE: I will not share your information with anyone else. I truly value your privacy. Badminton is quite unlike any other sport. It has it's own special way of moving, thinking and playing nevermind the completely unique equipment used. Because of this fact, the way your training should be approached is also very different to that of other sports. For example when comparing to one of it's closest rivals - Tennis, the basic movement of the feet is a short sprint to reach a shot, whereas in Badminton, you move across court using more of a shasse/shuffle, or side step/lunging type movement. When we look at the mechanics of playing a shot, the arm technique also varies considerably. With Tennis you need to keep an almost straight wrist. Whereas in Badminton the wrist is the place where all the movement, control and power is generated from. It's for this reason that Badminton training should be approached completely differently. WHATEVER SPORT YOU PLAY, YOUR TRAINING AND PREPARATION SHOULD CLOSELY MIMIC THE ACTIONS USED IN THAT SPORT. This means using training drills and exercises that not only improve both technique and co-ordination but also increase speed, strength and endurance in the muscles and body systems used. To start improving as fast as possible, you need to do these things every week, so to help you I've included a few techniques below that you can use to begin improving your own game right away. Badminton Training Tip #1 - Stay flexible - Here's 2 little known stretches that help to reduce the chances of suffering from elbow injuries and can also increase the power in every shot you play. Badminton Training Tip #2 - A totally different way to strengthen your hamstrings, so you can move quickly across court and lunge easily to reach low shots wherever they're played. Badminton Training Tip #3 - Strengthen the muscles of the forearms so you have more control and power in every shot. Making and using this unusual tool will make a big difference to your game. Badminton Training Tip #4 - This difficult exercise helps to build up strength, power and speed in the legs, heart and lungs, so you can keep going to the end of every match without feeling tired. Badminton Training Tip #5 - Get rid of back ache caused through playing Badminton. Stretching these muscles may be one of the easiest things you can do to avoid crippling 'next day' back ache. If you'd like to discover a complete range of exercises you can use to improve your game, then you'll love the full version of my cutting edge Badminton training system. The program includes 8 completely different Badminton specific workouts to improve every possible area of your game complete with detailed descriptions of all the easy movements and clear photographs showing you exactly what to do. Keep going all match long... with the same level of energy and power that you had when you started. AND you don't have to wait, because you can start using them straight away... in just a few moments from now. 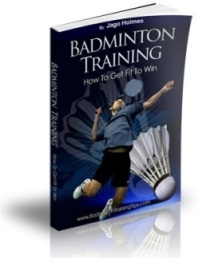 Once you order my NEW instantly downloadable fitness program - 'Badminton Training - How To Get Fit To Win,' you'll learn everything you need to know to take your game on to an entirely new level.